Arch Address Plaque crushed stone and resin personalized address sign. 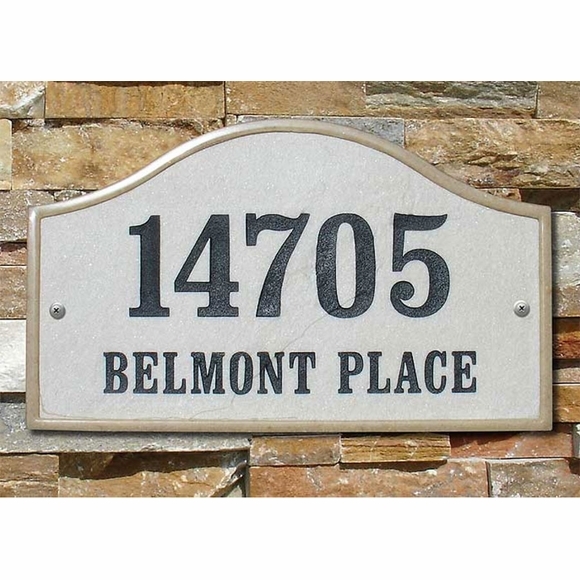 UV / weather resistant address sign features a rich stone textured background with polished border. This address plaque can be personalized with one, two, or three lines of custom-engraved text. One-line plaque holds up to six (6) 4" characters (including spaces). Please leave Address line 2 empty. Please leave Address line 3 empty as well. Two-line plaque holds up to six (6) 3" characters on line 1 and up to seventeen (17) 1.25" characters on line 2 (including spaces). Please leave Address line 3 empty. Three-line plaque holds up to six (6) 3" characters on line 1; up to seventeen (17) 1.25" characters on line 2; and up to fifteen (15) 1.25" characters on line 3 (including spaces). Heights may vary slightly due to text and the numbers of characters. The more characters in a line, the thinner the font. If ordering a 2 line or 3 line sign, please check character count per line and make sure that the sign you order can hold the number of characters you require. Available in either sandstone or slate finish. Engraved characters come in your choice of black, white, or mocha finish. Mounting hardware included. Optional lawn stakes sold separately, item 71731F, see Related Products area at right. Dimensions (approximate): 9.5"W x 15"L.
The engraved numbers are easy to read. The plaque has the feel of heavy-weight plastic; feels sturdy. Looked good from the front, but the back had a smear of white paint that stood out against the sandstone color of the plaque. This really didn't matter much since few people will see the back of my sign, but I could see it every time I went down my driveway, so I bought a can of sandstone colored spray paint & sprayed over the white paint. Now I am completely happy with the plaque.